several years ago, apple computer ran a story on the pro section of their website detailing how a professional photographer had covered the winter olympics. this poor fellow was pictured like a christmas tree, where the baubles were substituted for cameras slung round his neck, each with a different length, and doubtless weight, of lens. his cards of digital photographs were being offloaded by an assistant onto his apple laptop before being transferred to a second assistant for cataloguing and rudimentary processing, allowing him to continue shooting pics unhindered, in a quest for that one shot that would make the newspapers later that day. a frantic existence that existed for as many days as the olympic events continued, with barely a moment for a jam sandwich and a can of irn bru. 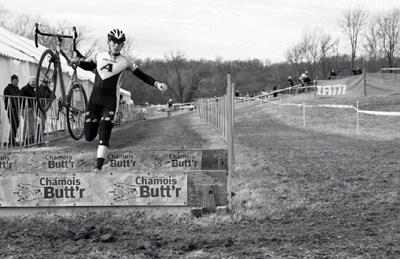 not my idea of fun, nor that of chris hinkle, who has produced this marvellous photographic testament to the 2008 north american cyclocross season. 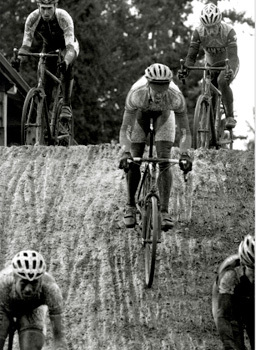 that'll be why it's called cyclocross. a professional photographer since 2003, chris presaged his lensmanship with three years as a bike messenger in minneapolis, where he also started racing knobblies, becoming a semi-pro and shifting location to santa cruz california. the cyclocross connection arrived via his training regime: resisting a road bike for training, he trained on the road using a cross bike leading to some dabbling in the sport with less than outstanding success. it's a truism that some of us are built for longer rides at lower heart rates than cross demands. however, in perhaps of similar mind to myself, chris loved the aesthetics of the sport, and this book is the return in different guise. chris hinkle isn't exclusively a cycling photographer: in fact, if you check his website, you'll find that he does a very intelligent and artistic line in wedding photography: "i enjoy photographing people and especially enjoy photographing athletes and/or unique passionate persons doing what they do. i have no desire to work for ap, afp, or anyone else shooting sports exclusively and having to get 'the finish line shot'"
this is amply reflected in the book's extensive variety of photographs (all in black and white to reflect the true grit of the sport), only one of which, as i recall, features the raised arms across the finish line. there are some close-ups of racing cyclists - including a very fine picture of molly cameron leading a chasing pack - photos of mud, photos of bikes, photos of muddy bikes, some lovely distance shots and a veritable breadth of photographs depicting those nooks, crannies and paraphernalia that accompany cyclocross racing that we forgot to take heed of when we were there. this, of course, is the true mettle of an accomplished photographer: seeing what others miss, and having the shutter speed to capture it. "this book was an escape from the pressure of an editor expecting certain shots - it was a great feeling when all of the photographers had to sprint to the finish line, to get so-and-so finishing, because that was going to be the headline. i didn't have to be there with everyone else; instead i could take my time to make a different collection of photos." so as winter draws in (it was the islay show yesterday - it's always winter the day after), there can be few greater pleasures in the lead up to the cross season, than to curl up in the armchair, with the curtains drawn and a glass of ginger beer and caramel chunky kit-kat at hand, slowly perusing this impressive and inspirational book of mr hinkle's photographs. inspiring from all points of view. at one time, all bikes were built this way, and if you're the eternal optimist like me, you have to believe that someday they'll all be built this way once again. i'm talking about tubes and lugs, at one time the only way to join together steel pipes that needed to go in different directions. tig welding (tungsten inert gas) wasn't a practical method all them years ago, and it's interesting (for me at any rate), that the reynolds steel tubes bearing those magic numbers - 531, 653 and 753 - were all manganese molybdenum, because that particular strain of metal lent itself very well to being brazed into lugs. when tig popped along, the mix was altered to chromium molybdenum (cro-mo) which suited welding better. but lugs were the business, not just because of the skill and crafstmanship involved in the perfect joint, but because they became the hub caps of the genre. when bikes were bikes, and men were men, there were limited painting options and versatility on the frame jig was more restricted, something was needed to differentiate model from model and builder from builder. curly hetchins was never a fifties football hero. even now, when north america has singlehandedly revived the art of the artisan frame builder, flowing through to impressionable europe, a disproportionate amount of time is spent on filing those lugs into the equivalent of 3d graphics. it's constantly a mystery of how and why victorian scrollwork should shine through the powdercoat as modern as modern can be. yet this lugging, should we be allowed to call it thus, appears nowhere else in our bijou world of cycling paraphernalia. there is no sign of a lugged saddle, you'll strain to find lugs on your handlebars, and bottle cages have shown no sign of adopting this embellishment now, or in the near future. so how strange, outlandish and utterly brilliant is it that lugwork should appear in a pair of cycle shorts. i, and presumably others, have long bugged paul at new zealand's solo cyclewear, about the likelihood of a pair of solo shorts to complement the rather fine range of jerseys purveyed over the last few years. it's not that it hadn't occurred to the guy on his own: you don't go into the cycle clothing market with your eyes shut, but mr mason wanted to do it right, not just to stick a pad in some lycra and screen a solo logo on the legs. so it has been an edifying process, one that has resulted in tests, in mock-ups, in rejects before that moment of satori revealed itself. glance longingly at the illustration to see just how well this concept has travelled from steel tubes to matt black lycra. 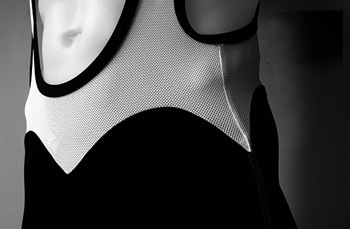 if you're one of the lucky cyclists who owns lugged steel, there's every possibility you'll want a very short jersey revealing the exquisite lugwork where the lycra meets the bib. you have to admit, you're all sitting there at home wondering why the heck you didn't think of it first, and how stunningly obvious it all is now that solo have made it stunningly obvious. 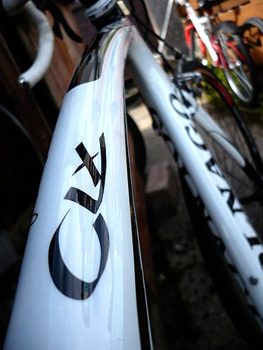 as mr mason explained "i walked past my steel slx colnago and there they were: lugs". the worst part about all this is, of course, the time difference: the pre-production arrives in new zealand soon; you and i will have to wait till november, when it's summer in the antipodes. but then solo also make rather fine kneewarmers until it's our turn. this oblate spheroid on which we live has been divided into seasons, which may vary in intensity depending on which hemisphere you inhabit, and depending on where you count one from. north america substitutes fall for autumn but otherwise the flow is uninterrupted. it's likely that all walks of life have divisions numbering more or less, but since we are of the bicycle variety, we shall concern us with the cycle seasons. for civilians, july is the height of one of those seasons because the telly, newspapers and magazines feature wall to wall tour de france. it's of little consolation that this brief interest in the pinnacle of cycling likely does not extend to the other two major tours in italy and spain which sandwich la grande boucle at either end. and if there is little hope for those two, there is even less for switzerland, paris-tours, the dauphine and poland is likely a lost cause. however, prior to entering stage race life, the classics top and tail the road season: flanders, roubaix, wevelghem leading to the dramatic end of season ride of the falling leaves. it's surely enough to keep even the most hardened of obsessives happy for the bulk of the year, and allow some respite before the tour down under leads out the next year. well, no not really, because there is another discipline that is loosely associated with road cycling except it's different, and for many of those involved, everything that precedes and follows is either simply alternative training or just gets in the way. 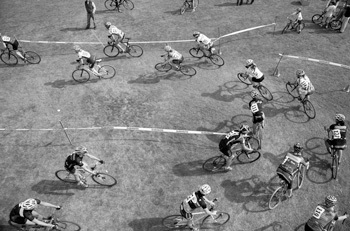 so has cyclocross developed a life of its own, no longer being simply a way of keeping fit between lombardy and the start of the classics, when the cycle season did not entertain the usurpers from the antipodes who have managed to blend one year into the next? as i have said, i know less than i'm letting on, so i asked around to the effect of: is everything else just so much skinny-tyred window dressing, until the real stuff starts in october? davie (the snake) graham, lives on the next substantial island up the west coast from us on mull, and is one of the leading lights in the scottish cyclocross scene. davie, like most i spoke to, loves his cyclocross: "some folks take it seriously while others, like me, are in it for the fun and the sartorial elegance." he's planning to race in all white kit this year, from shoes all the way to helmet "look out for the grey man at mull when the washingmachine can't do anymore". scottish cross allows for fancy dress races (there's a santa race on mull in december) as well as kids' and women's racing, and is perhaps one of the most accessible forms of racing, allowing for entry on the line in most cases. "the major differences are the participation numbers and crowd involvement; in the uk, spectators are few & far between and usually are involved or come with a rider (family etc), and in belgium where they are huge fans of the actual riders and the racing (fan clubs etc), in the usa it's almost a celebration of the event itself. and although way more people participate, the crowds are into the fancy dress wearing, cow bell ringing, hot-tub watching, beer drinking fun day out which doesn't happen elsewhere." "cross has this mystical european history which they love, but most of all it means the middle aged guy with a family can either take them all and they have fun, unlike a road race or sportive. or he can go race for 45 mins and be back home the rest of the day (bit like time trial mentality in the uk), and especially he can be competitive on more limited training which is hard in other disciplines"
at the risk of overplaying the portland card, pdxcross seems very much to be where it's at in a classic example of the coals to newcastle syndrome. many american cross aficionados are as obsessed with belgian cross, as are the belgians, taking a good thing and making it into an oft times great thing, and then giving it back to the world. on my second day in portland, i joined members of hup united for a road ride (may was too late and too early for cross): so enamoured of the european cross scene are hup united (the name comes from the belgian cherring 'hup, hup, hup') that they have their team kit manufactured by vermarc and the american sense of fun is telegraphed by the legend 'top tube goes here' on the right shoulder. a prominent member of hup united, is rapha usa's slate olson: "while all sort of racing is big in portland - we have a very active velodrome (alpenrose), a short-track mtb series and a full and fantastic road season - i don't think it's a stretch to say that cross is where the most excitement lies." according to slate, his whole year is about cross; the road season helps sharpen skills and gets him fit. "give me an hour in the mud at full-gas and I'm happiest". editor of embrocation magazine, and member of the rapha continental, jeremy dunn has, in the past, catalogued his 'zine 'late road, early cross' rather than specifying one of the more regular seasons as referred to in traditional publishing. jude kirstein of epic wheelworks in se portland, says that she's noticed an increase in the number of riders enquiring about cross specific wheels, and local component manufacturer, chris king, has produced a pair of cross specific hubs for the past couple of years, yet they don't offer a fixed wheel hub. prominent portland framebuilder and companion continental rider with mr dunn, tony pereira builds a handful of cross frames each year, and is just about to start a small batch for the coming season, including one for the women's class winner at the single speed cross world championships last year. tony says that cross frames are not a huge part of his business, but he is asked to build more and more each year. "because the races are so short, most racers come and watch the other races and there's a lot of time to get to know fellow racers. great friendships develop that come and go with the season. i know I'll see a bunch of friendly faces at the first cross race that i haven't seen since last december. after a long, beautiful and sunny summer the 'cross races also give us a nice distraction as the cold, rainy days of winter roll in." i can accept the criticism that i have only spoken to the converted, and there are doubtless as many riders in britain and america for whom cross is an insignificance (probably not in belgium). but i think my main point would have to be that enthusiasm for cyclocross is very much in the ascendency, and at the risk of betraying my celtic heritage, i think america has got it more right in relation to the great unwashed and their entourage, than any other country at present. i like my cycling to be inclusive, and while i can't honestly see me taking part in a cross race, i could see me being heavily involved in some way or another, should islay be fortunate enough to have the bug bite. in this respect, we're hoping to take the kids at port mor wheelers across the water to scotland and to mull to let them see cross at close quarters and perhaps even have a go. and we've already created a verisimilitude of a cross race at one or two of the saturday meets. however, while pdxcross and its adherents display little short of unbridled enthusiasm, for pure obsession you have to head further east, currently to connecticut but soon enough to franklin county, massachusetts. richard sachs, one of my best friends i've never met, answered my first e-mail enquiry with "i am f***ing obsessed bro. atmo", easily the least eloquent but screamingly honest reply i got when preparing this article. richard watched his first cross race in london's crystal palace around 1973. he'd been racing road for many a long year, and by the time the nineties dawned, staleness had all but set in. sachs had sponsored a road team since 1982, and around '94, one of the teams began racing the entire season, including cross. "gone were the attitudes and the professional cat threes who hid behind oakleys all summer. say hello to calmer cats who still raced to win. 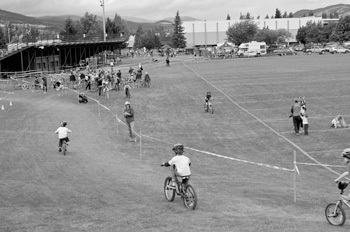 the 'cross courses were spectator friendly. the line of sight allowed most of the event to be seen from almost any spot along the way. the races were short enough for the attention span deprived, and every race on every saturday and sunday utilized the same start schedule. it made for a perfect day at the races, and i haven't even touched on the racing itself atmo." in that, richard has touched on two of the more important points of cross, namely the racing generally lasts around an hour plus one lap, and the course layout often allows excellent views of most, if not all of the circuit. it's along way from those interminable questions during the tour, when many a civilian wants to know how come mark cavendish has won six stages, but he's not winning the race. short of sorting out the lapped backmarkers, cross makes spotting the leaders less of a mathematical challenge. by 1998, richard had let the road sponsorship burn out and now exclusively sponsors a cross team. "the needle got in my vein from the first race and i haven't shut up since." his rather upfront enthusiasm for this particular branch of cycle sport is obviously infectious, as is that of the others i contacted for this article. personally i have never ridden cross, i don't own a cross bike, and i've only ever seen it on the telly, but already i can't wait. and while there can be little doubt that america is likely experiencing the largest growth in cross, britain, after experiencing a number of decades where it was there or thereabouts, is starting to catch some particles from the usa. 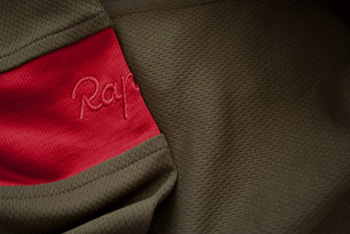 rapha brought to market a cross specific outfit last year comprising a long-sleeve jersey and bib threequarters, a situation that is about to be repeated for 2009, while colnago uk admitted growing sales and enquiries about their world cup and cross prestige frames, doubtless helped by the continued success of colnago supremo, sven nys. but then not everyone who loves their cross racing, enough to build a sixteen gear single speed cross bike (all the sprockets and rings were the same size), is so desperate to see the off-season disappear in a hurry. the sage of portland, and one of my best friends that i have met, chris distefano met my enquiry with this considered reply: "i refuse to discuss cross at this time. there is far too much summer to enjoy. 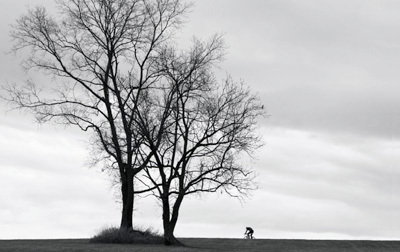 people are free to train and daydream, but i am not about to call upon the gods to hasten the arrival of cross season." i would like to thank all the above for their time and patience in replying to my questions about a sport i know all too little of. 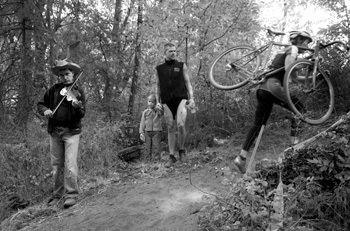 the black and while photos are from the pdxcross book dirty pictures' and the pdxcross.com website. i have long been favoured by the largesse of colnago uk by way of review/test models from the colnago range, something akin to experiencing christmas several times a year. but in most cases, the limit of their stay hovers around the two to three week period. i may have inadvertantly become an authority on colnago bicycles and frames, but there are other similarly well informed journals and websites to satisfy too, therefore hanging on to any particular jewel for too long creates a backlog, if not a monopoly. the opportunity to re-test this bike with a more favourable (for me) gearset was too good to pass by, but the experience was enhanced by conducting what i can only tab as thewashingmachinepost/colnago.cc first long-term test, having spent around three months on the bike before shipping it back to gosport. breaking with tradition, colnago uk have responded directly to consumer demand and built up the colnago clx with campagnolo centaur gears and offered such as an alternative to the far eastern shimano fare. 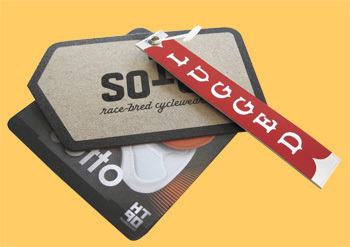 is this something that might appeal to your greater riding sensibilities? after all there are more than a few of us that see it as sacrilege to fit anything but vicenza on a colnago, far eastern monocoque or otherwise. have a read over my twelve weeks and 1200km worth of pedalling. a long time ago, i used to cycle from bowmore to port charlotte for an espresso at the croft kitchen, a round trip of about 36km, and i probably wasn't going very fast, though it didn't seem like that at the time. 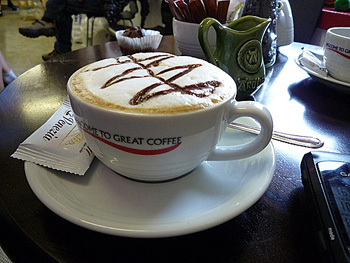 coffee and cycling are almost inseparable these days, and may always have been, but at the time the croft was the only place on the island that offered designer coffees, so it seemed the obvious place to cycle to. the sunday ride didn't exist. that was a day for going out in the car to places of interest around the island. of course, as the kids grew up, going out on any day of the week with parents had become anathema, so there was more time available at weekends for cycling, resulting in a sunday ride. at the time this was a solo event, and an espresso was only a possibility during the summer months. of course, you get set in your ways: the distance remained pretty much at the 36km mark, and had i been time trialling, i could have been timed with a calendar. but in the earlier part of this century, the mighty dave t moved to the area, and dragged me out on a sunday - dragged being the operative word. this is the point at which i realised just how set in my ways i had become, because the first ride with dave t was probably nearer 55km and at a speed that made my legs hurt. and he's about fifteen years older than i; after waving goodbye (dave t lives in the opposite direction to myself) it was all i could do to push the pedals round and get myself home. that's changed a bit in the intervening years - we now have mr hastings who has no compunction ripping the legs off us, whichever day of the week it is, and lord carlos of mercian who is far less of a speed merchant than any of us. so what to do on the sunday ride? simple: lowest common denominator rules. since the sunday ride is a collective agreement between consenting cyclists, we're ostensibly out for a mobile conversation in pleasant company, with rather fine scenery. the ride will be faster if lord carlos is missing, and faster still if neither he nor dave t are present. this is because jez can ride fast, and i'm too ashamed of my lack of fitness to tell him that i can't keep up, so i invite exhaustion long before it's coffee time. however, the time for busting a gut so to speak, is during those solo rides on a saturday afternoon, or while playing hooky from work during the week. if there's only me to please, and nobody else to consider, it would seem a shame to waste the opportunity for what i laughingly refer to as speed. i have heard of many a sunday ride where acolytes to the peloton are left to their own devices, oft-times meaning blown well out the back shortly after take-off. i've yet to meet anyone from a cycle club that will admit to this being the case, but independent adjudication from a variety of sources rather dictates that these clubs do exist. sadly, this seems a very exclusive arrangement, exclusive in the sense that several are excluded form the majority. not cool. there will be very few newbies who would return for a second helping if treated in this way. as far as possible, if we have kids out with us on a sunday, or some who don't have the opportuity to cycle as often as the rest, we keep the pace low and send someone back to pace stragglers. if that's not working too well because of weather or road conditions, then the frontispiece stops every now and again until gruppo is compatto. if nothing else, this guarantees that coffee time is a pleasant affair, without any of the pent up resentment or disappointment that would likely result from proving just how fast you can be on a piece of carbon fibre. and proving just how much of a prat you can be too. save it for the solo rides. all the videos plopped on thewashingmachinepost up till now have been created with a flip ultra digital video camera, the quality of which doesn't quite manage high definition (though flip do produce one that does), but it does provide sufficient quality for my purposes, and equates very well with my limited ability when it comes to editing in imovie. the ultra accepts two aa type batteries, meaning that it's a practical machine to use when out in the wilds of islay, if the batteries die. they're very easy to replace, always assuming i've remembered to carry spares in the first place. with my growing expertise in this area (i use the word in its loosest sense), the opportunity to test yet another variant on the growing number of compact digital video cameras, seemed like a fine one to take. 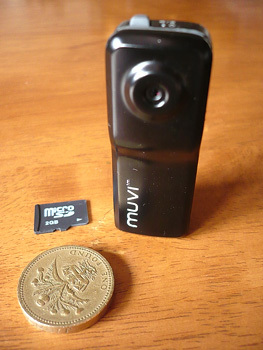 the muvi micro digital video camera is produced by uk company veho and is so small that i missed it completely when the box turned up through the post. the camera sits in a clear plastic lid inside the box, only i thought it was something to accompany the muvi, and rummaged inside looking for the camera. boy was that embarrassing, since i was about to phone and point out that i had all the plugs and cables, but no camera. this thing is tiny (see photograph), and stores its payload on something even smaller - a micro sd card (sitting above the pound coin in the photo above). the muvi arrives with a 2gb card, allowing up to an hour's worth of 640x480 footage at 30fps, though it will accept up to an 8gb card giving you up to four hours of video. the battery is a built-in lithium-ion, the video format is in the form of .avi files, making it windows and mac compliant straight out the box, and it also records audio from an impossibly small built-in microphone. in fact, pretty much everything you'd expect from a modern video camera, including a switch that allows it to be voice activated. connection to your computer of choice is via a usb plug, the socket for which also allows connection of a mains adapter for charging (supplied). my muvi arrived along with the optional extreme sports kit, since i had notions of clamping it to the bars of the company colnago, and possibly even sticking it atop the catlike whisper, to video whatever i wanted to look at. you have to marvel at just what can be fitted inside such a small package these days: the lens is barely larger than a pinhead, and the body of the muvi, unlike that of the flip, is solidly made from metal, and convincingly screwed together. now, despite the fact that the sports kit comes with a wide variety of brackets and straps, as well as a rubberised all weather casing, i could not find any practical way to fit the muvi to my helmet; since the catlike features round holes rather than the more common series of slots, a la giro, this may be one of those things that was just not meant to happen. however, the tiny rubber button atop the muvi would have made it very awkward to switch on and off when well out of the rider's line of sight. and given that there is an auto power-down, the button has to be pressed once to waken, and a second time to start recording. this latter is indicated by a a slowly blinking green led adjacent to the record button, but again there is no way for a rider to see if this has occurred when the camera is on top of a helmet. still, i daresay this is a problem that affects all helmet mounted cameras. more practically, however, i fitted the handlebar mount to the colnago to test out the muvi's capabilities of on the bike filming. now don't get me wrong, i have no great desire to film my ride to and from anywhere in particular, because i cannot see why such footage would be of any interest to anyone, but just in case i found myself in cavendish's wake at this year's braveheart ride, it's as well to be sure. in similar way to the footage from a flip clamped to the bars, picture quality was a bit bouncy. i left the camera alone initially, meaning it had to fend for itself over our less than smooth roads; later i held the centre of the bars and placed my thumb behind the muvi to stabilise it as much as possible. i've titled both of these phases in the demo video below, and you can see that neither are particularly good: the video is substantially distorted, appearing as if i'd been filming underwater, and despite it being a bright(ish) day, the picture quality is rather dark. additionally, the muvi seems to continually revise its reaction to the available light, producing what i can only describe as an effect similar to blinking (very noticeable on the footage taken inside debbie's cafe). colour is dark and very flat, with pronounced indexing in the foreground of the road. the latter part of the demo movie was taken during yesterday's port mor wheelers, and again, even though the camera was being hand-held, picture quality is poor, still marred by this blinking effect. the unfortunate trade-off by having such a small camera is the complete lack of any view-screen, so there's no way of telling just what is being recorded until the files are transferred to computer. it's likely that continued use would provide a solution here, but initially, i didn't always film what i'd hoped i had. sound (i left all the sound on the video below to give you an idea) is verging on the distorted, though wind noise while cycling pretty much affects every camera i've ever tried. the use of a weatherproof casing is a nice thought, since sticking the muvi to the front of the bike, or atop a helmet, is probably just inviting the heavens to open, however, there's a missing link in the thought behind this. when the camera is comfortably encased in this opaque rubber, it doesn't fit securely into any of the brackets supplied. there are two small prongs at the top of the bracket which clip into the centre gasket of the muvi's two halves. when the weatherproof coat is used, its thickness prevents these prongs gaining any purchase, so the first bump will launch the muvi to its destruction. this is less than joined up thinking, since there would seem to be few other situations where weatherproofing would be entirely necessary. all in all, i'm sticking with the flip: the muvi seems better made, but it has too many inconsistencies, it's not really particularly well designed for the purpose intended, and to be quite blunt, the video and audio quality is very poor. the muvi retails at £80 (not much less than the flip ultra) while the extreme sports pack adds another £20; i'm afraid i don't think it's worth the money.